As President Trump threatens to shut down the federal government over border wall funding, there have been some shake-ups in the White House. Interior Secretary Ryan Zinke will resign as he faces at least 17 federal investigations into suspected ethics violations. A new book by longtime consumer advocate, corporate critic and former presidential hopeful Ralph Nader links the criminality of the Trump administration to the unchecked power of previous U.S. presidents, including Bill Clinton, George W. Bush and Barack Obama. 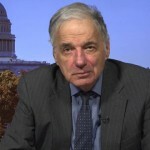 In “To the Ramparts: How Bush and Obama Paved the Way for the Trump Presidency, and Why It Isn’t Too Late to Reverse Course,” Nader argues that the U.S. federal government is fundamentally corrupt, warmongering and owned by corporations—but he also issues a call for members of the public to hold their representatives and senators accountable, including by building local Congress watchdog groups across the country and utilizing “citizens summons” to force members of Congress to appear before residents of their districts. In a historic vote, the U.S. Senate passed a resolution on Thursday calling for an end to U.S. military and financial support for the Saudi-led war on Yemen. This represents the first time in U.S. history the Senate has voted to withdraw military forces from an unauthorized war using the War Powers Resolution. The Saudi-led war in Yemen has created what the U.N. calls the world’s worst humanitarian crisis, with 14 million of Yemen’s 28 million people on the brink of famine. A remarkable piece in this week’s New York Times Magazine traces how bombs built by Raytheon in Tucson, Arizona, made its way into the Saudi arsenal and then were dropped on Yemeni villages. The article centers on what happened in the remote village of Arhab when U.S.-backed Saudi warplanes carried out a series of bombings on September 10, 2016. According to Human Rights Watch, at least 31 civilians were killed, three of them children; 42 people were injured. Journalist Jeffrey Stern is interviewed.